It may be hard to imagine that in today’s high-tech digital universe, when hackers can access your personal information with the click of a keyboard or a simple swipe, there are still thieves out there who are willing to rummage through your garbage to steal your identity. But surprisingly, it’s not only a very common method of theft, it’s perfectly legal! That is to say, once you’ve thrown something into your trash, even if it’s sitting just outside your home or your office, it is fair game to anyone in the world who wants to dig through it and essentially no longer belongs to you. Here are some of the facts that you need to know to ensure you don’t fall victim to garbage grubs. Americans have a lot of trash—and much of what is seemingly just plain garbage, is actually the gateway to your identity and the kind of personal information thieves are looking for. Think about how much junk mail you receive every day and how you dispose of it. If you’re like most folks, you throw away hoards of pre-approved credit card and loan offers, refinancing offers and a host of other documents without giving it a second thought. But for a dumpster diver, these items are much like the motherlode, chock full of information about you that they can then use to hack even further into your life. You’ve heard it before and you’ve probably thought about it, but it bears repeating here. Shredding unwanted documents is the key to keeping your identity safe. And this not only goes for all the paperwork that is so obviously significant, like old tax returns and all the forms associated with them, old bank and credit card statements, old medical records and any other similar documents, but also all that junk mail. It’s a harsh reality, yet something we all must face head on. It’s also critical to think twice before throwing away sticky notes with passwords (even outdated ones), phone numbers or any other little notes that you deem innocuous. Because these are also the just the kind of items that thieves look for. 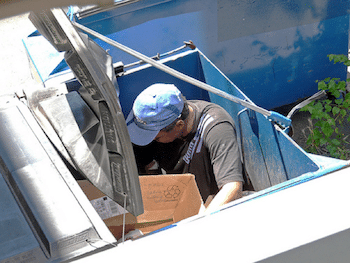 When you’re ready, give us a call at All Points Mobile Shredding. We’re here to provide you with onsite shredding of any and all unwanted and outdated documents—permanent destruction and the peace of mind that you’re protected. For more information about our residential and commercial services, fill out our online quote request form or call 772.283.4152. ← Holiday Travel: How Not to become a victim of identity theft!